OPELIKA, Ala. — On a windswept hillside in eastern Alabama, white crosses glimmer in the morning sun. Birds twitter in the nearby trees and a fine coating of dew sparkles on the grass like jewels. Angels’ tears, older Southerners call it. On this morning, in this place, no one would be inclined to disagree. A week ago, an EF4 tornado ripped through Beauregard, killing 23 people and injuring nearly 100. 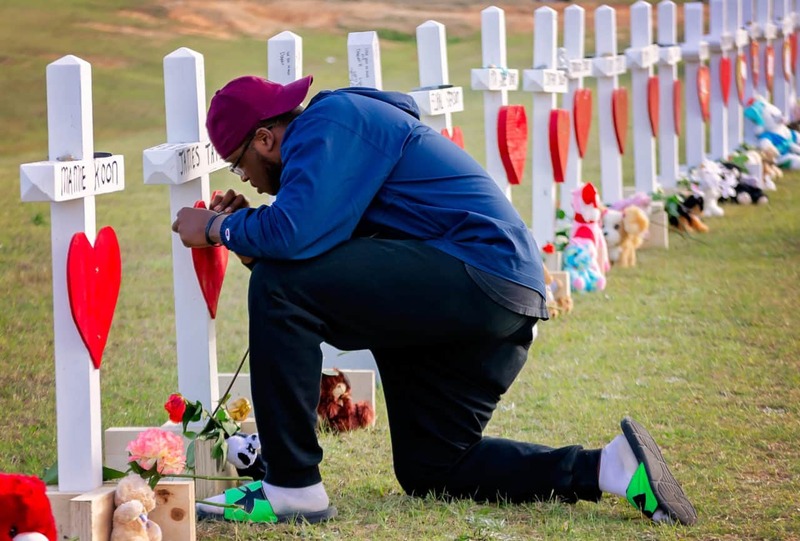 The violent tornado was one of 39 that touched down March 3 in the deadliest tornado outbreak in the United States since 2013 and the deadliest in Alabama since 2011. Manufactured homes were blown to pieces in 170 mph winds. Brick houses were reduced to concrete slabs. But buildings can be replaced, residents say. The victims, who ranged in age from 6 to 89, were part of the rich tapestry that made Beauregard special. The fabric of the close-knit community has been torn asunder, and the only things they have left are their faith and each other. Beauregard – an unincorporated area east of Auburn and south of Opelika – is made up of four-way stops and pock-marked two-lanes that wind their way through the forested hills. It’s a place where Sundays were made for worship, flags were made for flying, and everyone gets along unless Alabama is playing Auburn in college football (when all bets are off). People salute the military, support the police, and pull over when a funeral procession approaches, whether they knew the deceased or not. Around here, most everyone knows everyone, and right now, every heart in Lee County is broken. 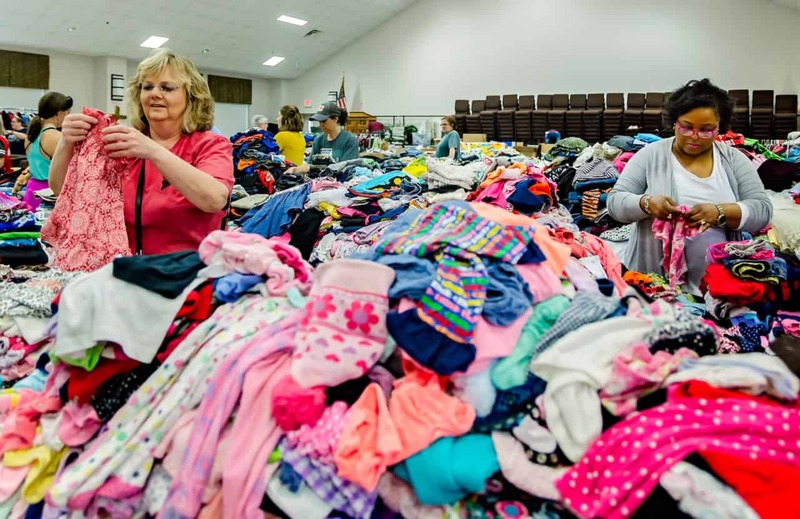 The grieving has just begun, but recovery is well underway, with Providence Baptist Church – the site of the tornado memorial – serving as both the logistical and spiritual hub for disaster relief. Ten minutes after the tornado passed, church member David Dismukes grabbed his chainsaw and headed out to clear roads. He met others who were doing the same. When the sun rose Monday morning, people were lining up at Providence with donations, and Mr. Dismukes found himself in a new role: volunteer operations manager. Outside the church fellowship hall, a steady stream of cars follows signs directing them toward volunteer sign-up, donation drop-off and pickup, or one of the many service agencies onsite, from the Federal Emergency Management Agency to Alabama Baptist Disaster Relief and Samaritan’s Purse. Inside is a bustling marvel of organization. Tables groan beneath the weight of donated clothing, neatly labeled by size. Cases of water and Gatorade flank the walls. Dishes are sorted and stacked. Other tables hold sleeping bags, children’s toys, paper towels, and cleaning supplies. And there is the occasional odd surprise, too, like pink ice skates in case an Alabama girl finds herself on a frozen pond someday. At a table of baby clothes, Cheryl Key folds onesies with Gwen Shaver and Lucy Walton. Ms. Key drove down from Valley, not knowing what she would find. Ms. Shaver and Ms. Walton came from nearby La Fayette. They felt driven by their duty as Christians to help. Mr. Dismukes has been heartened by the local response as well as the people who have traveled from as far away as Texas and Pennsylvania to lend a hand. He sits down heavily at a table in the fellowship hall, making a space between stacks of Bibles for a barbecue sandwich he probably won’t get time to eat. Rumors that he is sleeping on a cot at the church are inaccurate, but the long hours he is devoting are not. An hour ago, a barefooted woman stumbled into the building, crying. She told him her mother was dead and she had lost everything in the tornado. “I don’t have anything,” she told him. After assessing her immediate needs, he connected her with more resources. He doesn’t say it, but his worry is evident. This morning, he gave a child a teddy bear, not knowing if it would help. Mr. Dismukes draws a shaky breath, closes his eyes, then opens them and looks around the room, still dazed by the volume of contributions and volunteers. As the day draws to a close, the crowds thin out around the church and swell again at the site of the white crosses. For some volunteers, this is where they begin and end their day. “Mommy and Daddy love you so much,” says a note on 10-year-old Taylor Thornton’s cross. A.J. Hernandez, 6, was remembered by his mother. Terry Freeman, 18, kneels in front of James Tate’s cross and writes a note, then kneels again in front of Henry Stenson’s cross and does the same. Mr. Freeman was a star athlete at Beauregard High School and now studies business marketing at Chattahoochee Valley Community College. He knew Mr. Tate and Mr. Stenson through his church choir. When he fills a survivor’s car with donations, he’s not just giving them paper towels and garbage bags – he’s trying to fill them with love, compassion, and empathy. He also doles out a hefty supply of hugs to anyone who seems to need one. He is busy with school and two jobs, but he knew he had to make the time to come back home to help the people who made him the man he is trying to become. Alabama, Beauregard, Christian Science Monitor, disaster, Opelika, tornado. Bookmark.